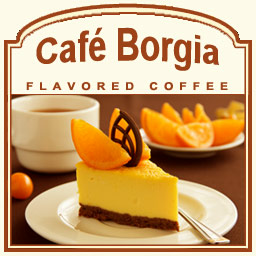 The Caf� Borgia flavored coffee is an interesting mix of oranges and dark chocolate. If you like the citrusy, fresh aroma, the taste of sun-kissed oranges, and have a sweet tooth for a warm, melted chocolate, these 100% Arabica beans blended with these ingredients of the Caf� Borgia flavored coffee will sweep you off your feet. With a hint of creaminess added, you will feel like you�re drinking a dreamy chocolate-orange treat. A heat-sealed valve bag will ensure the freshest coffee possible, which will be both roasted and shipped on the same day. The orange and chocolate undertones complement each other in this Caf� Borgia flavored coffee, so go ahead and give into this deliciously smooth and luxurious flavored treat.